Columnist Neil Reynolds has devoted his column to The Canadian Century in today’s Globe and Mail. Finally, amid the pervasive gloom, comes an exuberant expression of optimism – nay, faith – in Canada’s future. Remarkably, it comes from three economists, practitioners of the famously dismal science. The 20th century, they say, wasn’t destined to belong to Canada, as turn-of-the-century prime minister Sir Wilfrid Laurier once asserted it would be. But Laurier, wasn’t really wrong, they say – he was merely premature. Make it the 21st century instead. But, bit by bit, Canada has tentatively restored, or begun to restore, Laurier’s lost tenets – a restoration successively accomplished by Conservative governments (notably, Brian Mulroney’s free trade agreement with the United States in the late 1980s and early 1990s), NDP governments (notably Saskatchewan premier Roy Romanow’s principled return to balanced budgets in the 1990s) and Liberal governments (notably Paul Martin’s paying down of the national debt in the late 1990s and early 2000s). Canadian Century celebrates the good beginning that the “redemptive decade,” with its tentative return to Laurier’s lost tenets, provided – apparently, given the great global recession, just in the nick of time. It laments the retreat from these tenets that the recession produced. 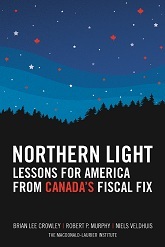 Now, the economists say, is the time to finish the job – now that Canada’s opportunity has been doubled “by America’s confusion and loss of direction” – and by its own loss of the tenets that produce enduring prosperity.